Mexico has succeeded in attracting a long list of oil companies to the country for potentially billions of dollars of investment in new drilling. The historic energy reforms of 2013-2014 liberalized the oil and gas sector, opening it up to private companies for the first time in seven decades. However, the oil industry is now on edge ahead of Mexico’s presidential election in July. The incoming administration will likely be dramatically less friendly to the oil and gas industry, and the new government could slow the pace of auctions. But while there are risks and potential setbacks for oil and gas drillers, fears of a wholesale return to state-owned control of the energy sector may be overblown. The country is clearly in need of reform as crude oil production is expected to fall to 2 million barrels per day (Mbd), compared to 2.7 Mbd in early 2015 (see IEA graphic below). The historic reforms passed several years ago ended the monopoly that state-owned oil company Pemex had on the energy sector, allowing international firms to lease and operate projects for the first time in recent memory. The changes led to a series of auctions beginning in 2015. The results of those offerings were modest at first, but became increasingly successful with each passing round. In January 2018, for example, Mexico awarded 19 offshore blocks in a widely successful offshore auction, nine of which went to Royal Dutch Shell. The Anglo-Dutch oil company had made a significant discovery in U.S. waters nearby a few months earlier, raising expectations for the Mexican areas. Mexico’s government said the auction could eventually lead to $93 billion in investment. Companies eyeing Mexican assets are worried that a new government will roll back the energy reform, slow development, or even try to renationalize the assets that they have purchased. But there has been a bit of anxiety in the industry during the last few months because many companies eyeing Mexican assets are worried that a new government will roll back the energy reform, slow development, or even try to renationalize the assets that they have purchased. “There is indeed a feeling that these could be the last (auctions) for a while,” an oil executive told Reuters in March ahead of an auction. The frontrunner, Andres Manuel Lopez Obrador (AMLO), fervently opposed the historic energy reforms when they were passed several years ago. More recently, however, he has sent mixed signals. His comments have ranged from trying to fully overturn the energy reforms to more measured statements about keeping Mexico an attractive place for investors. 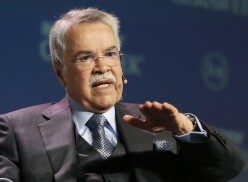 Still, he has consistently indicated that he would slow or halt oil auctions going forward. “I’m going to ask [President Enrique Peña Nieto] that he doesn’t hand out any more oil blocks, neither onshore or shallow waters, and that he puts a stop to the privatization of oil and electricity sectors,” Lopez Obrador said in March. While future offerings could be curtailed, AMLO has largely stopped short of calling for opening up existing contracts with private oil companies. Despite the industry’s worst fears, rolling back or renationalizing oil assets is highly unlikely, not least because AMLO will close the door on billions of dollars in investment. “No matter what [political] party you are from, it is really hard to say ‘no’ to…billions of dollars,” an executive at an oil major told the FT.
Revising or scrapping energy reform would require a constitutional change, ratified by the states—an incredibly high bar that may be unattainable. More importantly, revising or scrapping energy reform would require a constitutional change, ratified by the states—an incredibly high bar that may be unattainable. As such, the liberalization is almost certainly here to stay. “If the new president wants to review the contracts, of course he can do what he wants. But he cannot change them. We are legally in charge. The contracts are safe,” the head of Mexico’s oil regulator, Juan Carlos Zepeda, told the FT.
That does not mean there will not be new roadblocks for the oil industry. Lopez Obrador’s top energy advisor, Rocio Nahle, who is thought to be his top pick to become energy minister, recently hinted at support for new local content rules. On May 20, she tweeted an infographic that seemed to support a call for 80 percent local content in oil contracts. That would likely draw attention from any oil company operating in the country. The AMLO administration probably will not roll back the partial privatization of the energy sector, but his government could try to steer the windfall to benefit the Mexican people. 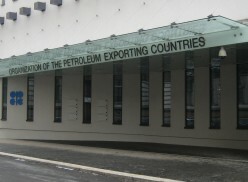 But the oil industry may interpret any attempt to impose local content rules as a burdensome expense. Analysts point to cost inflation in Brazil as a reason why local content rules could backfire. Mexico’s refineries are in poor shape, they are operating below capacity, and they are losing money. Meanwhile, the cornerstone of AMLO’s energy agenda calls for massive public investment in refineries. He has suggested limiting crude oil exports in an effort to process oil into gasoline and diesel for the domestic market. Mexico’s oil production has plunged, but so too has its refining output, forcing the country to steadily increase gasoline imports from U.S. refiners. In 2014, Mexico imported a little less than 200,000 barrels per day (b/d) of gasoline from the U.S., but the total more than doubled to 421,000 b/d by 2017. U.S. shipments of gasoline to Mexico hit a monthly record high last November at 655,000 b/d. The trend is clearly increased reliance on the U.S. for its fuel needs. Fixing downstream problems will be difficult. Mexico’s refineries are in poor shape, they are operating below capacity, and they are losing money. AMLO has indicated he wants to pour billions into upgrading these refineries while also investing in one or two brand new refining facilities. 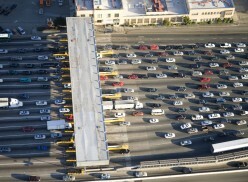 If his administration moves forward on this proposal, it would cut gasoline imports from the U.S., although any change is likely several years away. The economic backdrop of the presidential election also presents challenges for Mexico. The peso has been hit hard amid negotiations over reforms to NAFTA. The currency fell to its lowest level in more than a year on June 5, after news reports suggesting the Trump administration may scrap the current three-party talks between the U.S., Canada, and Mexico in favor of bilateral discussions. The renegotiation of NAFTA potentially has ramifications for cross-border energy flows, but the fallout from these negotiations is hard to predict. The economic backdrop of the presidential election also presents challenges for Mexico. 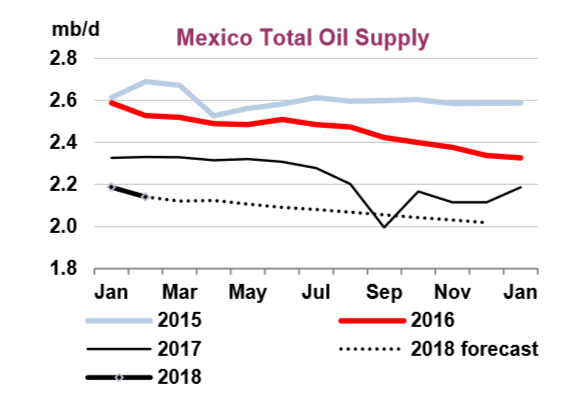 To the extent that Mexico is facing economic pressure from a weakening currency and headwinds from U.S. tariffs, the incoming Lopez Obrador administration will be under even more pressure not to touch the energy reforms. Nevertheless, a victory for AMLO would mark a significant sea change from the current administration, although how radical that change is remains to be seen. Lopez Obrador has widened his lead according to recent polls, putting him far ahead of his closest rival. Barring some radical change in the makeup of the election, he will likely win the vote on July 1, causing uncertainty for potential investors in the country.